In the previous post we started exploring how to interface our FPGA to the SDRAM on the ZYBO board. We ended off the post with writing the User Logic for interfacing with IPIC. In this post we will continue creating a workable block design and see if we can write to SDRAM from FPGA. Time for us to create an AXI Interface Block. Start off by creating a new Vivado Project, also choosing the Zybo as the target board. 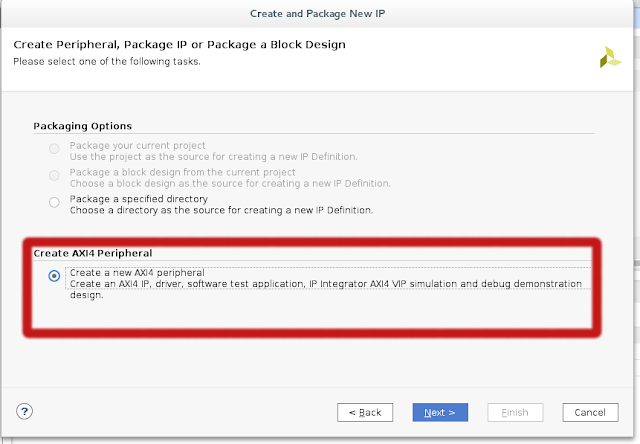 This option will create an AXI Pheripheral for us. On the next wizard page click Edit IP and then Finish. In the ports section you will see all the AXI Master signals defined. In the code it also provides the user a couple of places to add some custom code or ports. 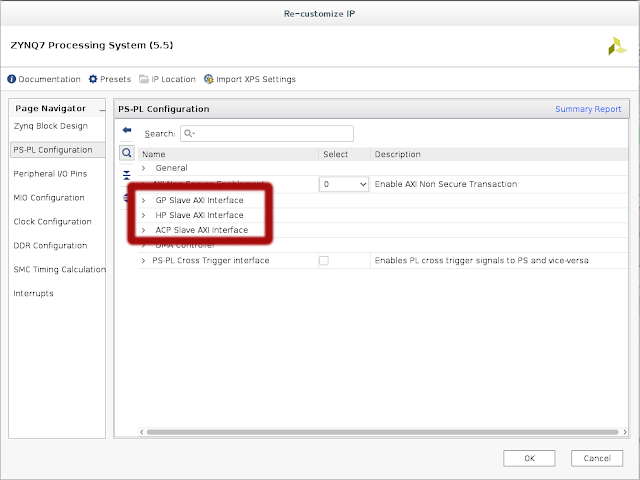 Towards the end you will see an instantiation of the AXI bus interface with the instance name myip_burst_test_v1_0_M00_AXI_inst. We will need change this instance to an instance of the AXI Master Burst Core, which we covered in the previous post. Firstly you need to locate the source file for AXI Master Burst Core within your Vivado installation. In my installation it is located in the folder Vivado/2017.1/data/ip/xilinx. The folder 2017.1 will be different in your case. It should be the version number of Vivado you are using. Now, within the xilinx folder you will see folders for different IP's. The folder we are interested in is axi_master_burst_v2_0. Moving into this folder you will see three folders: doc, hdl and xgui. When you move into the hdl folder you will see a file called axi_master_burst_v2_0_vh_rfs.vhd and this is the file we are after. A vhd file is also a Hardware Description language file as Verilog is one. Vivado can work with both formats. You now need to add the file as a design source to your current IP Project. 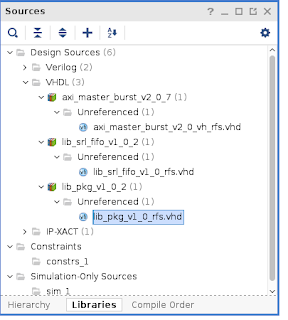 The vhd file you have added have some additional dependencies that you need to add, which can also be located in the xilinx folder. 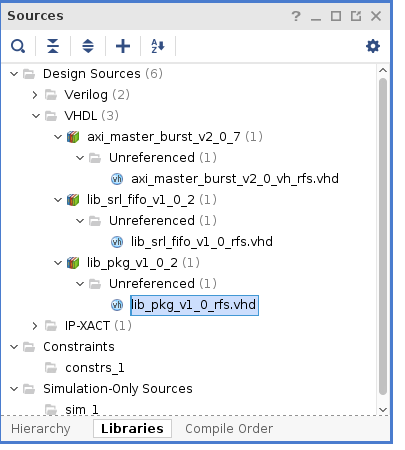 You need to add the vhd files for these dependencies in a similar way: lib_pkg_v1_0 and lib_srl_fifo_v1_0. It complains about a module not found in library lib_srl_fifo, with a hint that the library might not exist. This is despite the fact that we added lib_srl_fifo_v1_0 to our project. If you now close down all the source edit panels for these vhd files and reopen them, no errors should be reported. You will see that we hooked up most of the Master AXI ports to our Burst instance and some are unconnected. 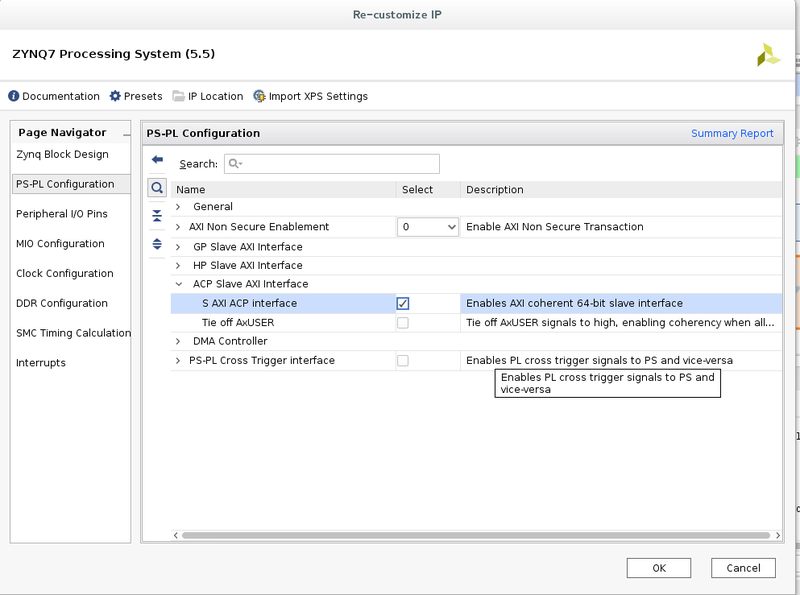 Some AXI Master ports are required, but not present on the AXI Master Burst instance. For these ports we have hooked up to constant values. You will also notice the ip2bus_inputs and ip2bus_outputs ports, similar that we defined for a module we defined in the previous post. With all these changes performed you can now package your AXI enabled IP. With the IP we have developed in the previous post and the AXI enabled IP we developed in the previous section, we are now ready to create the full block design. 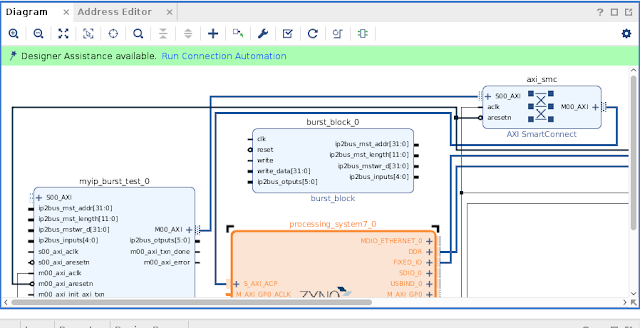 Since we need a ZYNQ Processing System block to access the SDRAM, we will start off adding this Block together with auto connection. Next, we need to add the two IP's we have created in the previous section and in the previous post. 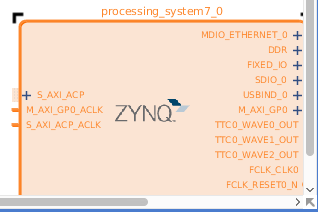 One thing that is missing is an AXI slave port on the ZYNQ Block to connect he AXI Master port of our Burst Block. Slave ports on the ZYNQ need to be enabled via ZYNQ IP Customization. Accelerator Coherency port (ACP) Slave Interface: Low latency access to Masters, with optional coherency with L1 and L2 cache. The question now is which AXI Slave port should we enable? 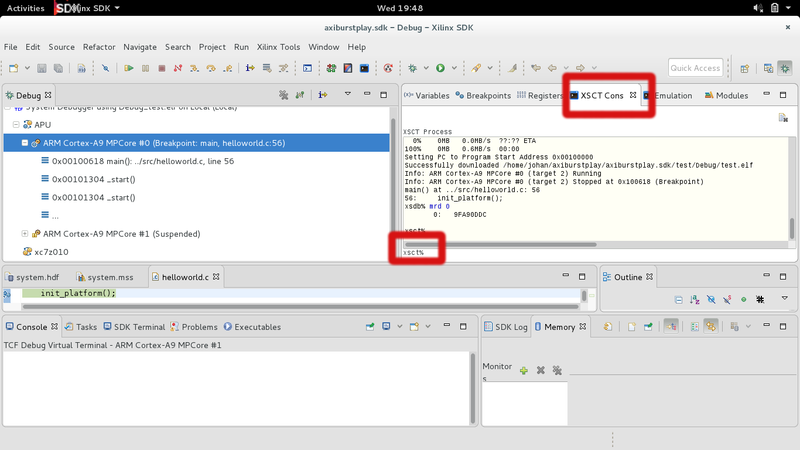 We should keep in mind that in the beginning we will inspect memory most of the time with the XSCT console within the Xilinx SDK. The XSCT always see data from the same perspective of the active CPU core via the L1 cache. With the XSCT console in mind, the ACP slave port will fit our needs perfectly. With the ACP port we don't need to worry about seeing stale L1 cache values, since if we write data to DDR via ACP, our L1 cache will contain also contain the written data. A Snoop controller (https://en.wikipedia.org/wiki/Bus_snooping) takes care of this in the background. 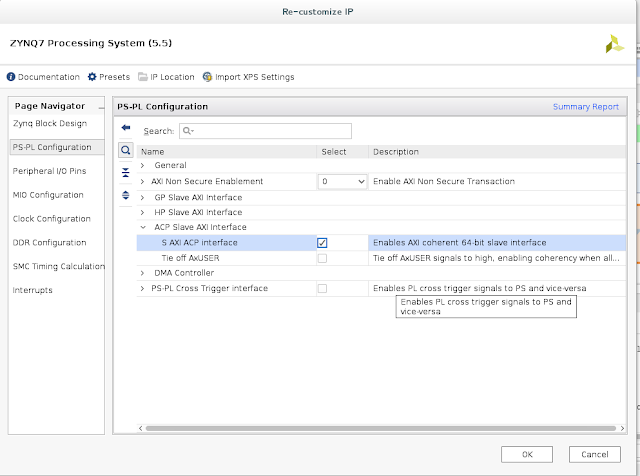 You will see that the Connection Automation introduced a new Block, an AXI SmartConnect. Everything looks connected now, except for the write and write_data ports of burst_block_0. We need to create an IP block that can generate test data feeding these wires. Nothing more than a state machine waiting some time before sending data. Assuming a clock speed of 100MHZ, this block will wait about 3 minutes before sending data. 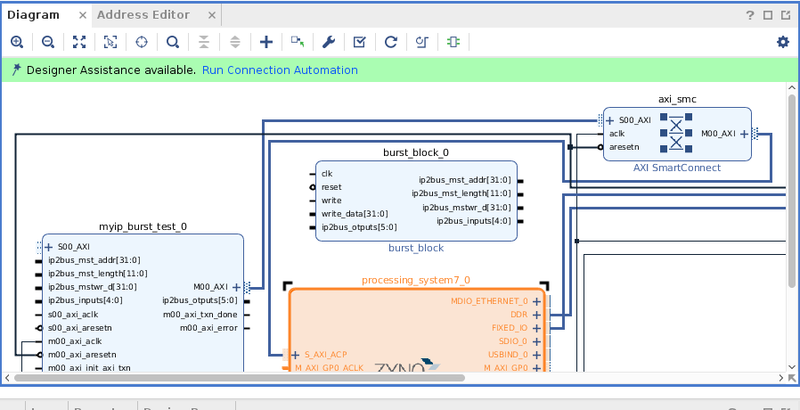 This give you enough time to get everything in the Xilinx SDK up and running. 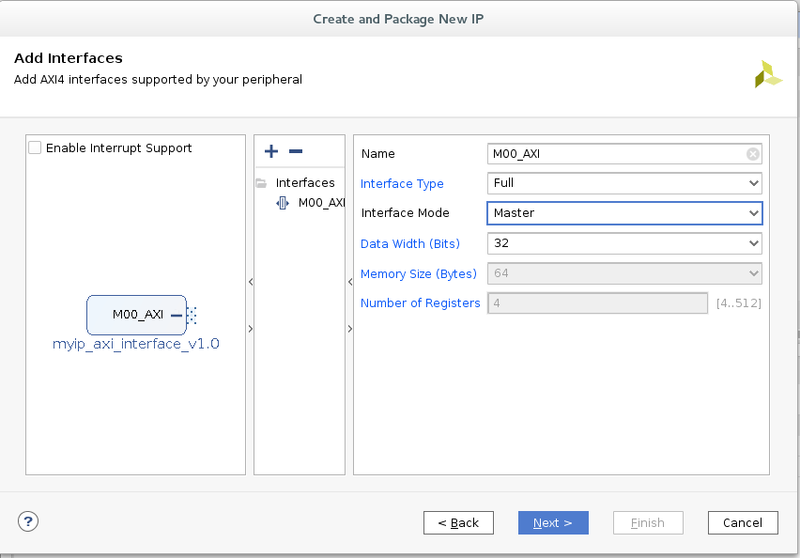 Add the New IP to you rblock design and link up with the write and write_data ports. You are now ready to Run Synthesis and then Generating the Bitstream. After generating the BitStream remember to Export the Hardware. 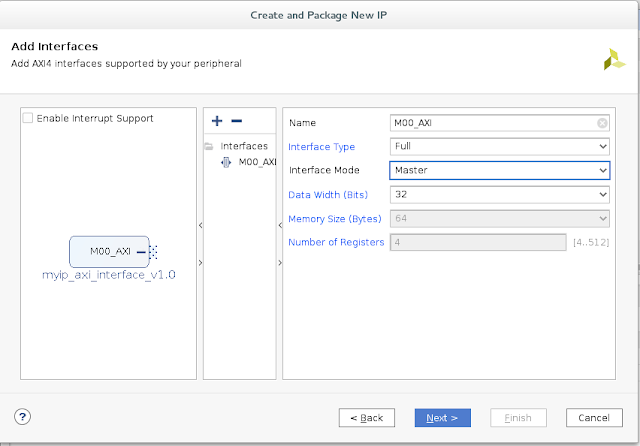 You can then launch the Xilinx SDK. 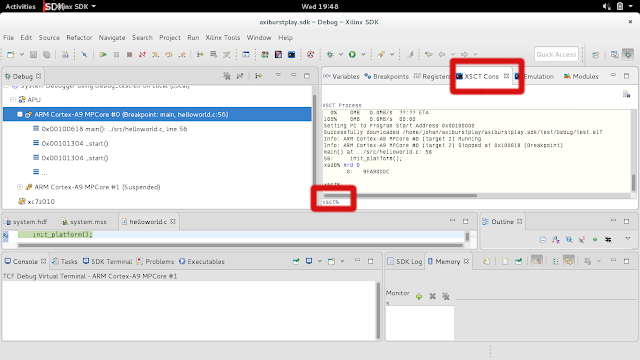 We are now ready to test our design within the Xilinx SDK. For our testing we just need a plain HelloWorld App. The app is just required to get one of the CPU cores in a runnable state so that we can use the XCST console. Ensure that the FPGA is programmed and fire off the HelloWorld App in Debug Mode. CPU Core#0 is at a breakpoint within the Main function. Within above screenshot I have also marked two important areas. The first one is where you can locate the XCST console tab. The second area is the actual XCST console where you will be entering the command. At this point in time there would be still a number of minutes left before our FPGA core will write some information to SDRAM. As you might have guest, mrd stands for memory read. It is expected to see some initial random number. After about three and a half minutes our FPGA core should have written the values 0 to 4 in the first four memory locations. This variant of the command states that the contents of eight consecutive memory locations should be returned starting at location 0. This shows that our FPGA core actually managed to write successfully to SDRAM! Before ending off this section, I just would like to mention something interesting regarding ACP and Caching. Assigning a zero this signal will effectively disable ACP coherent writes. If we ran the steps in the previous section with the user signal set to zero, the L1 cache would cling to the value 9FA90DDC upon the first read and wouldn't pick up the changes our FPGA core made to that memory location. So, be careful of caching! In this post we completed the Block Design for testing writing to SDRAM from an FPGA core. 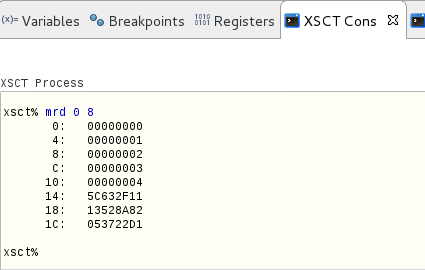 We also confirmed via the XSCT console that the write was indeed successful. In the next post we will start to develop a VIC-II core.